Did you know that Japanese sake is actually a type of beer, not a wine? Your tongue has about 10,000 taste buds, so put them to good work and try a new beer! 85 to 90% of beer consumed in Canada is manufactured in Canada. How many industries can say the same thing? Canada has one of the highest beer taxes in the world. In Canada, beer has 3 times the economic impact of wine and spirits combined. The Canadian brewing industry has reduced its energy consumption by 58% since 1990, which is beneficial to the environment and saves costs. Local breweries annually purchase 300,000 tonnes of Canadian malting barley. Malting is a process where the precious parts of a grain of cereal are awakened and used to create flavour, colour and mouth feel in beer. The malting process begins by soaking the grains in water for several days. This process (soaking) is designed to replace nature by providing the water and oxygen needed for the grain to grow. After several days, the grain is allowed to grow naturally under controlled conditions of temperature and humidity (germination). The last step in malting is warming the grain to reduce moisture, create a colour and flavour and stabilize the malt. Brewing barley in Canada is about 20% Of all the barley produced here and is considered a speciality crop. Other grains that can be used include wheat, rye, oats and sorghum. Each of them has advantages, but barley continues to be the majority of all grains used in the brewery. Even in wheat beer, the proportion of barley is generally higher than 50%. This is due to the reality that other grains are malted without pods and are difficult to filter on their own. Malt provides a spectrum of beer colour that goes from pale straw to black. The pale malt creates the lighter colour and flavours observed in the easier beers to drink and soak thirst while the dark malts are responsible for richer and more robust colours in wearers and stouts. A variety of caramel coloured malts use to have an impact on colour, but more so to create complex aromas and aromas in beer. Kilning is the source of almost all malt flavours in beer. Maillard Chemistry is the science of caramelization and explains the colour, flavour and aroma of malt. All waters are not created equal: the origin and treatment of water have an impact on the finished beer, both at the molecular and sensorial levels. Brewery masters often consider that the water used in the beer is "soft" or "hard". Hard water has higher levels of mineral content (usually calcium and magnesium) while fresh water is largely free of minerals. The fresh water allows a beer to gently enter the mouth and also extends the finish. Hard water, on the other hand, can increase the characteristics of the hop, arrive with distinct clarity and come out of your mouth quickly. Burton-upon-Trent in England is renowned for having the toughest brewing water in the world and due to its impact on the creation of Pale Ales and India Pale Ales has also created a unique word for re-mineralization. Burtonisation is now an accepted term in infusion for the addition of calcium sulphate and magnesium sulphate to the brewing water. In Canada, there are many places where water is hard. Many brewers filter their water before brewing. It is very important to remove chlorine, fluoride and any other component that can negatively affect the flavour of the beer. Hops must be boiled vigorously to extract the bitterness. Hops are cultivated between the 35th and 55th parallel in the northern and southern hemispheres because they require specific summer day lengths to produce cones. Hop plants can grow up to 6 meters in a year and quite often 30cm in a day. Most of the hops that are used in the brewery are grown and grown in the United States or Germany, but many other countries, including Canada, contribute to the overall world hops agriculture. Hop varieties were transported from Europe to the New World and planted by settlers. Descending strains of some of these plants can still be found wild in the countryside in climates where hops bloom. Low alpha acid hops are generally used to create fine flavours and are added very late in the brewing stage. Hops with higher alpha acids are considered bittering hops and are added very early in the kettle during boiling. Modern brewers often refer to IBUs as a measure of bitterness in beer. The International Bittering Unit (IBU) measures the remaining alpha-acids after boiling. The scale is normally from 0 to 100. Lighter beers will generally measure between 6-17 IBU, while North American APIs can often reach IBU over 60. Although this is a scientific measure, it does not measure perceived bitterness. For example, a high-malt beer may have an IBU of 80, but it can only be perceived as 40 because of the balance between malt and hops. The flflavoursnd aromas of hops are largely determined by terroir (impact of soil, water, time and sun). Brewers choose the type of hop they want based on the style of beer and whether the flavors and flavors will attract the interest of the beer drinker. Most of the brewed yeasts belong to a family called Saccharomyces. Ale yeasts work best at warmer temperatures and therefore take longer to ferment. Lager (a German word for aging) yeasts are best used at colder temperatures and fermentations take almost twice as long as ales. While many small brewers buy their yeast from reputable suppliers, large brewers actually propagate their own exclusive strains of pure yeast. Yeast is remarkably temperature sensitive and can create completely different beers with only a small temperature variation in the brewing process. Any carbohydrate (other than malt) is considered an adjunct in the brewing terms. This word is defined as an alternative source. Ingredients like dried fruits and spices have been used for centuries to create flavor and aroma in beer. Examples include orange, coriander and non-malted wheat. Some beers use other grains such as rice and maize as a complement to malt. The goal behind these lighter flavored cereals is to create a beer with a lighter body and a softer taste. This brewing mode is designed to produce beers that are light and easy to drink. 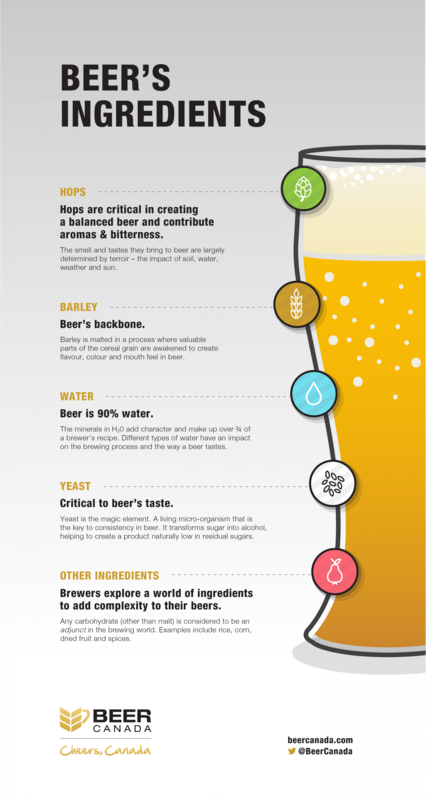 More Resources: Beer Ingredients inforgraphic. When experimenting with taste-testing, try to take notes with a mechanical pencil, as the smell of a wood pencil can affect your perceptions of the beer in question. The head on the side of your glass? That is called "lacing" and is a sign of a clean glass and a good brew. Professional tasters may prefer their beer be presented in stemmed white wine glasses because of the shape: by holding the stem, the beer is not warmed up by the judge's hand, while the upward lip of the glass allows the beer's aromas to flow freely. Amber glass bottles provide excellent protection against light (natural and artificial) that interacts with hop compounds and can cause the beer to have a "skunky" taste. Beer with this quality is sometimes called "light struck" beer. More resources: The Perfect Pour infographic. In history, the brewing of beer emerged around the same time that communities of nomadic tribes took up agriculture, growing cereals for subsistence. Brewing was a domestic art, practised mainly by women in their own homes for personal enjoyment and special occasions. Sumerians, the first great civilization of Mesopotamia, are well documented in their love of beer and the importance of beer in their ancient culture. There is documentation of diet beer brewed in ancient Sumer. It was called eb-la, which translates as "lessens the waist". The first brewer registered in Canada is the Jesuit brother Ambroise, who began making beer in 1646 after the founding of New France. A few years later, the Grand Intendant Jean Talon founded Quebec's first commercial brewery in Quebec City to reduce the colony's dependence on imported brandy. The brewery, inaugurated in 1688, was so successful that its beers were sold in the West Indies, making it the first Canadian beer ever exported. Louis Pasteur published "Beer Studies" in 1876, an essential document describing the causes of the spoilage of beer and suggestions for avoiding it. Beer was so important at the beginning of Canadian culture that at the time of Confederation in 1867 there was already a tradition of brewing established in the colonies. During the period of settlement in Canadian history, the tavern served as a place to have a pint, a meal and perhaps a bed to stay the night. But they also served as a gathering place for the community: where judges would hear complaints, politicians would ask for votes and preachers would convey their message. The first Canadian drinkers would have thought that the term "social drinking" was redundant: having a pint meant being among compatriots in a public drinking establishment. Canned beer gained consumer popularity with soldiers who had returned from World War II, familiar and comfortable with cans of their time abroad. The increased use of glasses has allowed bar guests to have a good overview of what they drank, a luxury not offered by old tin and terracotta cups. This has led to the decline in the popularity of the porter and to an increase in the popularity of pale ales and other varieties of light coloured beer. The historical dominance of beer in western Canada is partly explained by the influence of German-American brewers immigrating north to the prairie towns with the intention of serving thirsty customers.